Suki Organic Skincare hails from the USA and is a pure organic skincare brand, made suitable for sensitive or eczema prone skins, pregnant and nursing women and even children. I was sent 3 products from their line for combo to oily skins. I do have combination skin but tending to the dry (slightly oilier T-zone and drier cheeks) so do bear that in mind when I tell how the products fared. 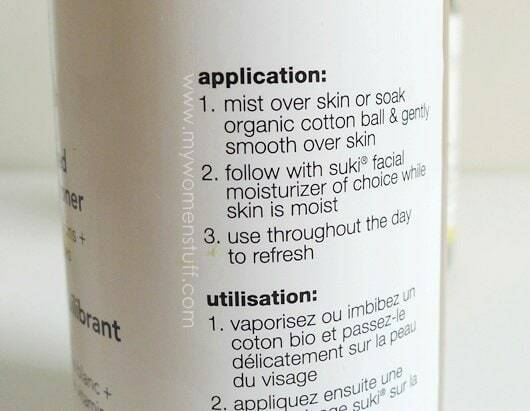 The Suki Creamy Foaming Cleanser comes in a glass bottle. Gotta be careful with this in the shower! But I do like how sturdy it is. Granted, the glass bottle can be a hazard but unlike many brands I’ve come across, the pump is very well made and it pumps out surprisingly little. I wasn’t paying attention as usual so I only used one pump (the instructions said to use 2 pumps) but although I wasn’t expecting too much of it, it lathers up very nicely and cleans the skin very well, without stripping moisture. The toner is a facial mist. As the instructions point out, you can spritz it over your face after cleansing, or onto a cotton pad to apply on your skin. I use the former method, because I like a quick fix, and I like spritzing mists on my face 😀 The nozzle in the pump spritzes out the toner in a very fine mist that is very comfortable, and I love the scent! Its got a lavender scent I find very calming in the morning and evening. The liquid is not clear but slightly murky and I do upend it to mix it up before I spritz. I saw from the ingredient list that there was chamomile and lavender to sooth the skin and inflammations, and there is white willow in there which is supposed to be a natural salicylic acid to reduce inflammations. Well, I was foolish and was out in the sun without sufficient sunscreen on my neck and shoulders so the skin there was slightly inflamed by evening. Not burnt, but it smarted a little. On a whim, I spritz some of this mist over and there is a nice cooling effect that helped sooth the discomfort. I did it a few times over a few days and felt fine thereafter. But for the fact its a rather heavy glass bottle, I’d love to carry this around with me. When I was applying this, my sister sniffed the air and said “Whats that smell of yuzu?” Yes, this lotion has a very strong, sharp citrus but not quite citrus scent. Its not unpleasant unless you dislike that sort of scent. This Balancing Day Lotion is targeted at those with combo-oily, eczema, acne-prone or easily inflammed skin and I think that if you are of that skintype, you will like this one. I use it in the day only (since it does say its a day lotion) and it absorbs very quickly into the skin without leaving any residue and best of all, it does not encourage oil production throughout the day. Its really nice, except that I found it a little drying for me. I resorted to mixing in a drop of the Kiehl’s Midnight Recovery serum to help (which it does) or using a hydrating serum under this. This way, it felt much more comfortable on my skin. The ingredients have an anti-inflammatory slant to calm and heal the skin. I use 1-1.5 pumps smoothed over my skin and as I said, its very comfortable on, just perhaps not quite for my combo-dry skin. If you are interested in trying out the Suki Organic skincare line, do note that Pure Tincture carries Suki trial sets that have a range of products in mini sizes that you can try out before you commit to the full sized products. Prices range from S$23-35 and I think its a great way to try out a new brand. The other good thing is that the shipping to Malaysia has been kept at a flat rate of S$10 by Fedex. I think that’s very reasonable for shipping by courier as it arrives very quickly and safely. Payment can be made by Paypal. 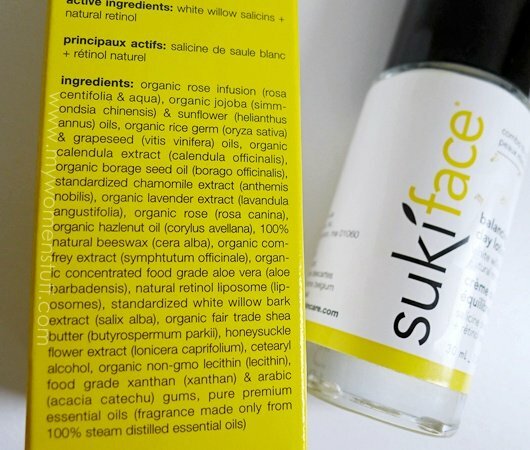 Suki Organic Skincare is available online at Pure Tincture which is based in Singapore and ships internationally. Shipping to Malaysia as at today is a flat rate of S$10 by Fedex. Disclosure: Featured products were sent by the distributor for consideration. For posting guidelines please read my disclaimer. ahhhh! i was almost confused with the ‘sukin’ in red bottle, for a moment i thought this is another line! u know, my favorite word is ‘soothing’ mist and ‘moisturizing’ mist now, anything with them will catch my eye! Hahaaa I knew most people would be confused 🙂 I do quite like the line but perhaps the one I tried is better suited for those with oily skins. Yeah, I thought could it be spelling error when I first saw the header, oh well , it is a totally different product. I am using the Sukin cream and foam cleanser, both are love for me. I wasn’t too enamoured with Sukin but I didn’t try the face care only the haircare and body wash. I’ve heard of a lot of good reviews on it though. It is rather pricey.. I’ll pass this one and give Sukin a try first. Thanks for sharing, PB! You could try this one, since its an online store based in Singapore anyways. Perhaps try the trial kit? You should try out their SukiFace Exfoliate Foaming Cleanser. it’s really good!